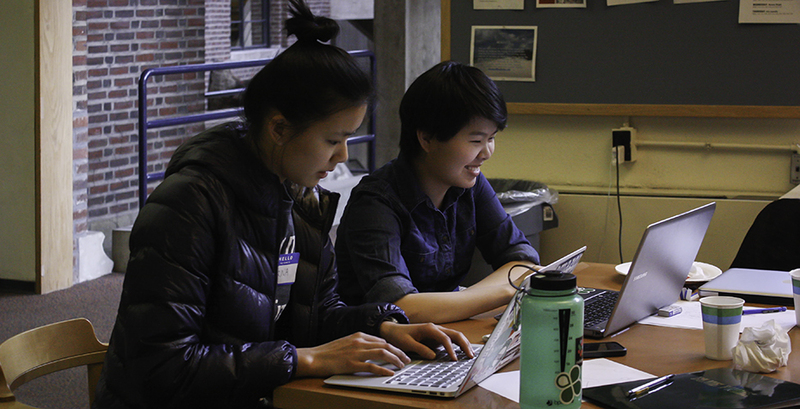 Last weekend, eight teams of Wellesley students took on the challenge to create mobile apps in WHack, the college’s first 24-hour hackathon. “Hackathons” are marathon programming sessions when programmers and designers congregate to create an application within a limited frame in a spirit of friendly (and frenzied) competition. WHack is unique in that interested students from all majors and fields of study, not just computer science, were invited to attend. Staff from Rosie, a startup based out of Cornell University with an app that allows users to order groceries online for pick-up or delivery, sponsored and judged the hackathon in partnership with the Computer Science Department. Cali Stenson ’17 became involved with organizing the event after her professor Eni Mustafaraj noticed her excitement about Hour of Code last year. “She thought my enthusiasm for computer science would be helpful throughout the process of planning the hackathon. I was interested because [computer science] is my intended major and I want to share it with the world as well as learn new technology as often as possible,” she said. Eight teams composed of students from multiple disciplines arrived at the Science Center on Saturday morning for introductions and opening remarks. Coding began at 1 p.m. and ran for 24 hours—fueled by free pizza and periodic workshops by computer science faculty and Rosie staff members—before Sunday afternoon presentations to the Rosie team. Apps were judged for viability, creativity, and quality of the team presentation. Among the eight apps produced, the winning entry was Free & For Sale 2.0, a new interface for the popular college resale group. Get Stuff Done, a creative quest-based productivity app, came in second, with Mapping Wellesley, earning third and College Connect awarded an honorable mention.